My apologies for my badness in updating recently; had a mega busy week last week followed by a nasty cold this weekend, so it's been a bit of an effort to drag myself to the PC and find something to write about. Thankfully i'm just about recovered now, so can give you something uber-special. 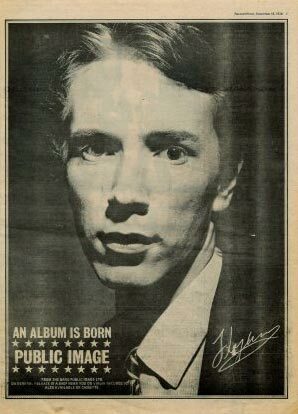 Whilst Mr John Lydon is out and about pimping the Pistols circus again, it's always nice to remember when he truly was one of the most interesting MUSICAL figures in Britain; someone who made revolutionary sounds as well as the constant talking of talk. For their first three albums at least, Public Image Limited were one of the most exciting almost-mainstream British pop bands of the 70s/80s. If you haven't heard Metal Box by now, you're missing out big time. Any chance of posting some of the remixes and b-sides from the Metal Box era? I bought Metal Box a couple of months back but I really haven't been able to get into it. I read later that apparently, the only version that comes close to the band's original vision is the first vinyl release. Oh well, I still think those Peel sessionn tracks are more listenable than the CD version I have.